By Dale Johnson Posted: June 5, 2017 4:00 p.m.
President and Vice-Chancellor Dr. Vianne Timmons recently participated in graduation ceremonies for students in Nunavut, who studied in a partnership offered by the U of R and Nunavut Arctic College. The ceremonies were held on June 1 in Arviat, which is 1,300 kilometres northeast of Regina, and on June 2 in Rankin Inlet, almost 1,600 km northeast of Regina. The communities are on the west coast of Hudson Bay, north of Manitoba. 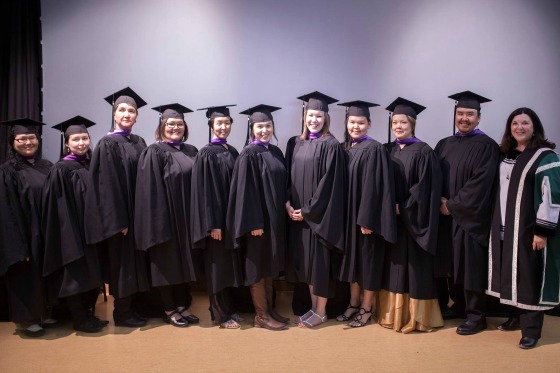 The students graduated from the Nunavut Teacher Education Program (NTEP), a partnership between the U of R’s Faculty of Education and Nunavut Arctic College that began in 2007. It is the only sanctioned Bachelor of Education degree offered in Nunavut. “These graduates, all with children, worked so hard to complete their Education degrees. I am proud of each and every one of them, and thrilled that I could be there to celebrate with the communities,” says Timmons. The students earned Bachelor of Education degrees with an Elementary School Concentration. Some of the students took courses in Regina during their fourth year. Ceremonies are also being held this month in Iqaluit – 2,600 km northeast of Regina – at another campus of Nunavut Arctic College that offers the joint program with the U of R.
With that ceremony, there will be a total of 21 graduates in the program this year.